Note the colorful "import grouping by types" is NOT available in the free version. used to be a flat structure, now includes a \pestudio\xml\ hierarchy. @ Special: Thanks ... and updated. It's at v8.09 as of this writing. This program is really quite amazing for what it does, I just wish it was easier to make sense of what a lot of what it says, if the dev is reading this, maybe you could add a context menu for google searching things, like right click> google search > kernal32.dll, or wsock32.dll for people wanting to look these things up easier. And would it be possible to have it expand on some of the features it lists, like many programs will say "The Image modifies the Windows registry" but it would be nice what its doing, if possible. 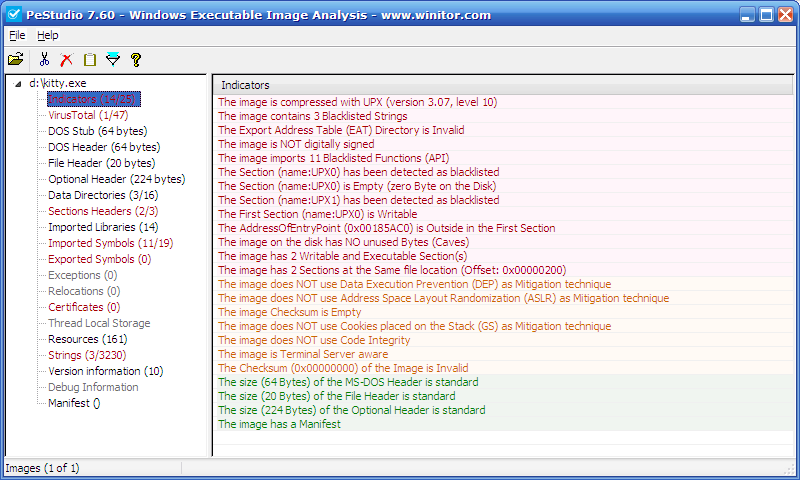 A ChangeLog.txt file is included within each release of PeStudio, 1st file in the zip package. I thought it would have been nicer with a changelog, that's why I first posted a comment. Why not just edit the entry? 1. Command-prompt usage is functioning correctly again. 2. Silly oversized typeface in Manifest section has been cut back to reasonable size. @Marc: Pourvu que cela dure, ..;-)...let's keep our fingers crossed ! The command prompt usage "Pestudio file:-typical.exe" is broken again as of version V7.52. Regarding my previous post - it seems there is a registry entry for a Borland Database Engine file, specifically 'idr20009.dll', which wasn't pointing to the right location. I'm not sure if PEStudio loads it or some other driver on my system, but its now working. resizable GUI would be feature i'd like. @Ruby: the 'Current' directory will always point to the lastest version of PeStudio. Is that 'Current' permalink to a stable or beta? The homepage currently has PeStudio 7.00 listed. @JayXon: Thanks ... download link changed. @Magibon: thanks for your input. Highlight and copy to the clipboard are on my todo list. I'll implement these features. Would be nice if we could just highlight, and copy into clipboard... but the XML dump is better than nothing. The PeStudio351.zip package is now working! PeStudio 3.47 has a bug when filtering the Libraries. This will be corrected very soon. Thanks. PeStudio 3.47 has been released. It is now faster than ever..
for any question, problem, you can directly mail to me, the developer, at info@winitor.net. Thanks. @ Danny: thanks for using PeStudio! Please provide more info - e.g: platform, file analyzed. Thanks. I have just tried PeStudio 3.40 on W7 32-bit, with tree.com. PeStudio 3.38 now supports command line parameter like: pestudio.exe %1 and pestudio.exe "%1"
PeStudio ver. 3.34 / Windows 7 x64: PeStudio GUI opens successfully but selected components fail to open. @navinbhai: The changelog is located within the app ZIP file. It would be better if the changelog is published on the website instead. What a program! Daily update? Even what is updated is not known. Version 3.22 has been made available (with a changelog). Logfile is now XML based. Debug info and certificate are detected. This feature it planned, thanks to be patient. At this point, I have set the focus on the programmatic interface (the parser - peparser.dll). The UI, which is 'only' a client application consuming the parser, will be changed in the next...days. Please tell me why you use PeStudio, what kind of features you like...and what you are missing. Thanks. GUI is too large to work with Netbooks (1024x600). Any way to resize it? @Bass Changelog. Of course I can. Cheers. Thanks for PeStudio. Can you add a changelog with each new version? Cheers. PeStudio is still under development. It will soon provide command line parameters. It will also support more compressed files. Yes PeStudio (still) crashes when inspecting BitComet (which is compressed using PECompat). Thanks for your comments! Opening BitComet.exe it crashes. When it can open BitComet.exe than it crashes at clicking on the Imported Libraries or Imported Functions. Feature proposal: Define binary that is to be opened via commandline parameter. That way, one could integrate calling this nice app into filemanagers (i just tried calling it from total commander via pestudio.exe %1, and noticed that this doesn't work). PeStudio has been Updated to Version 3.15 and now can start without the Visual Studio libraries. I just tried it on a clean Windows XP SP3 box and it runs. It was DLL-hell in my case, because i did already have that library installed - just not in the required version. Such situations were the main reason why MS began to store such libraries no longer centrally in system32, but instead in seperate directories, "to reduce DLL-hell." Anyways, thank you for this great application. Looking forward to the next version. Hope you will enjoy the next version. Thank you, Lyx! Sorry about that! Noted! Doesn't launch here. Error-Dialog "The ordinal 7138 could not be located in the dynamic link library mfc90u.dll". This is a plain WinXP SP3 install that was kept very clean. I also tried downloading an mfc90u.dll version from the web and putting it in the app dir - no change. Too bad, because this app looked VERY interesting.